Posterior reversible encephalopathy syndrome presents with neurological and imaging features that are reversible, if prompt diagnosis and treatment is undertaken. However, the disease has been more commonly described in adult population, especially in eclampsia. In the background of predisposing factors like renal disease or chemotherapy, the pediatric population is also at equal risk for this condition, as we would like to present through this case and also demonstrate the potential for complete reversal of symptoms and imaging findings if diagnosed without delay. An 11-year-old boy, a known case of chronic kidney disease (stage V) on maintenance hemodialysis, presented with one episode of generalized tonic-clonic seizure approximately 30 minutes prior to presentation to the emergency center. He was in altered sensorium following the episode of seizure. There was history of high-grade fever (upto 103°F) for 3-4 days. On examination, he was found to be drowsy; however, he was moving all four limbs. His blood pressure in the emergency room was recorded to be 140/100 mmHg. Laboratory tests revealed a serum creatinine of 4.8 mg% and blood urea of 121 mg%. His total leukocyte count was 22,200 per mm 3 with Hb of 10.2 gms. Serum calcium, sodium, and potassium were 7.8 mg%, 135 mEq/L, and 5.3 mEq/L, respectively. MRI brain at admission showed T2W/T2 FLAIR hyperintensities, s/o oedema, involving the subcortical white matter of bilateral frontal, parietal, and occipital lobes, with few areas of cortical involvement [Figure 1]. Similar lesions were also noted involving bilateral basal ganglia, left thalamus, splenium of corpus callosum, as well as brainstem [Figure 2]. Diffusion-weighted imaging (DWI) showed increased signal intensity in the lesions in bilateral occipital lobes and in the splenium of corpus callosum. A diagnosis of PRES was made on the basis of these findings. The patient was started on antiepileptics, antihypertensives, and antibiotics, with daily hemodialysis. He had four more episodes of seizures during his hospital stay; however, he slowly improved clinically and was discharged on antiepileptics and antihypertensives on biweekly hemodialysis. Follow-up MRI brain was done after 2 weeks, which showed near-total resolution of the brain lesions [Figure 3]. Although PRES commonly involves the parietal-occipital region, three different imaging patterns have been described. The first was the holohemispheric watershed pattern with a linear involvement of the frontal, parietal, and occipital lobes predominantly, along a watershed distribution. The second was the superior frontal sulcus pattern with predominant involvement of the frontal lobes, and the third was the dominant parietal-occipital pattern in which the typical predominance for the posterior lobes was maintained. Other than these patterns, asymmetrical and/or partial manifestations of the primary patterns were also described. In our patient, the pattern seen could be best described as holohemispheric watershed pattern. Atypical sites of involvement that have been described include brain stem, cerebellum, basal ganglia, thalami, internal capsule, and splenium of corpus callosum, ,, with uremic encephalopathy sometimes described as having a propensity for central distribution. In our patient, lesions were noted in the brainstem, bilateral basal ganglia, left thalamus, and the splenium of corpus callosum. DWI and apparent diffusion coefficient (ADC) have been found to be helpful in differentiating atypical presentations of PRES from conditions like central pontine/extrapontine myelinolysis, non-hemorrhagic infarcts, and hypoglycemic or hypoxic encephalopathy. Due to vasogenic oedema in PRES, ADC shows increased values with slightly increased signal intensity on DWI, whereas the other conditions show reduced ADC values due to cytotoxic edema. Our patient demonstrated increased intensity on DWI with increased ADC values in the splenium and occipital lobes. The symptoms and lesions of PRES may resolve completely if the diagnosis and treatment is prompt, as was seen in our patient; however, failure to diagnose may lead to irreversible infarction and death. , Recurrence of PRES is rare and may be associated with infections and rapid rise in blood pressure. The diagnosis may be overlooked, especially in children, unless a high index of suspicion and precise clinical history is maintained. We maintain that PRES should be kept as a possibility in children presenting with encephalopathy and seizures in the setting of raised blood pressure or renal disease as delay in diagnosis and treatment may result in permanent neurological deficit. 1. Hinchey J, Chaves C, Appignani B, Breen J, Pao L, Wang A, et al. 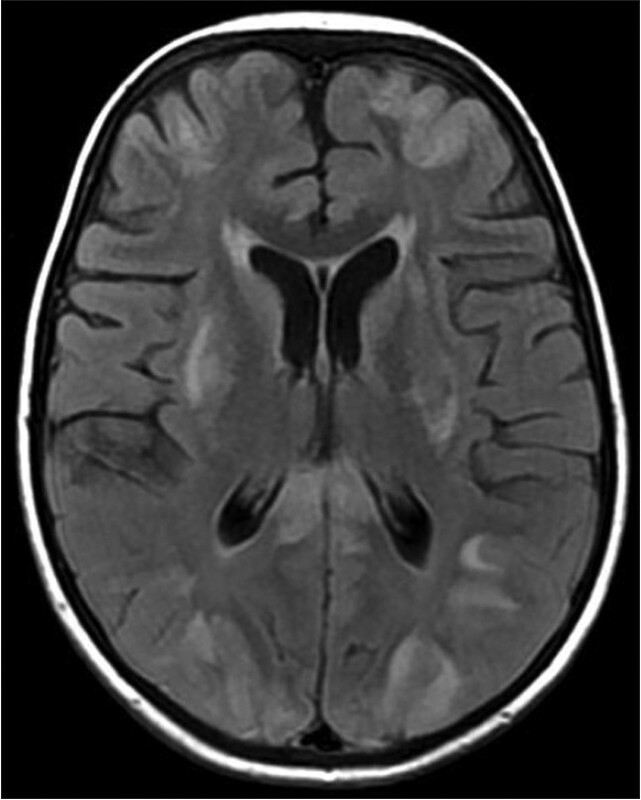 Reversible posterior leukoencephalopathy syndrome. N Engl J Med 1996;22:494-500. 2. Giriºgen I, Tosun A, Sönmez F, Özsunar Y. Recurrent and atypical posterior reversible encephalopathy syndrome in a child with peritoneal dialysis. Turk J Pediatr 2010;52:416-9. 3. Ozcakar ZB, Ekim M, Fitoz S, Teber S, Hizel S, Acar B, et al. Hypertension induced reversible posterior leuoencephalopathy syndrome: A report of two cases. Eur J Pediatr 2004;163:728-30. 4. Bartynski WS, Boardman JF. 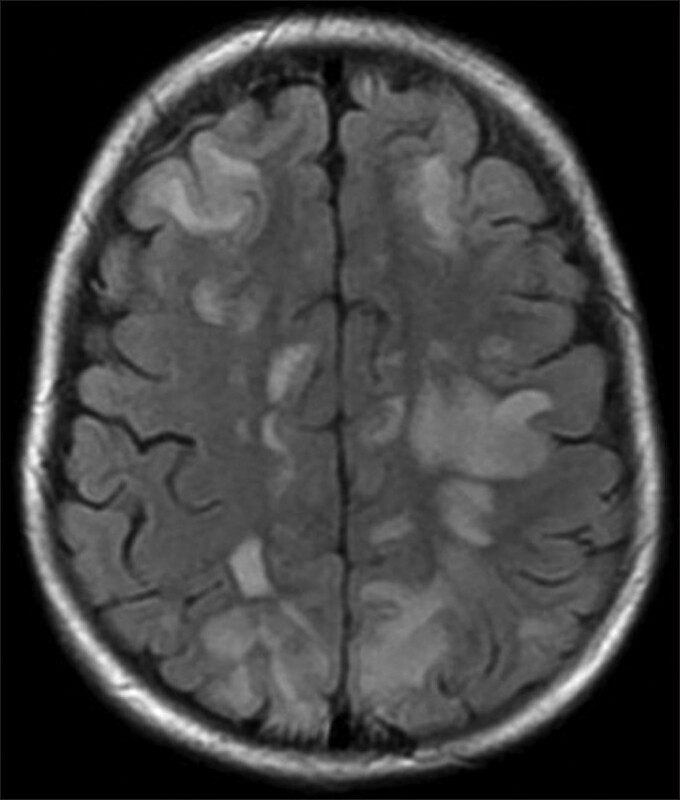 Distinct imaging patterns and lesion distribution in posterior reversible encephalopathy syndrome. AJNR Am J Neuroradiol 2007;28:1320-7. 5. McKinney AM, Short J, Truwit CL, McKinney ZJ, Kozak OS, SantaCruz KS, et al. Posterior reversible encephalopathy syndrome: Incidence of atypical regions of involvement and imaging findings. AJR Am J Roentgenol 2007;189:904-12. 6. Prasad N, Gulati S, Gupta RK, Sharma K, Gulati K, Sharma RK, et al. Spectrum of radiological changes in hypertensive children with reversible posterior leucoencephalopathy. Brit J Radiol 2007;80:422-9. 7. 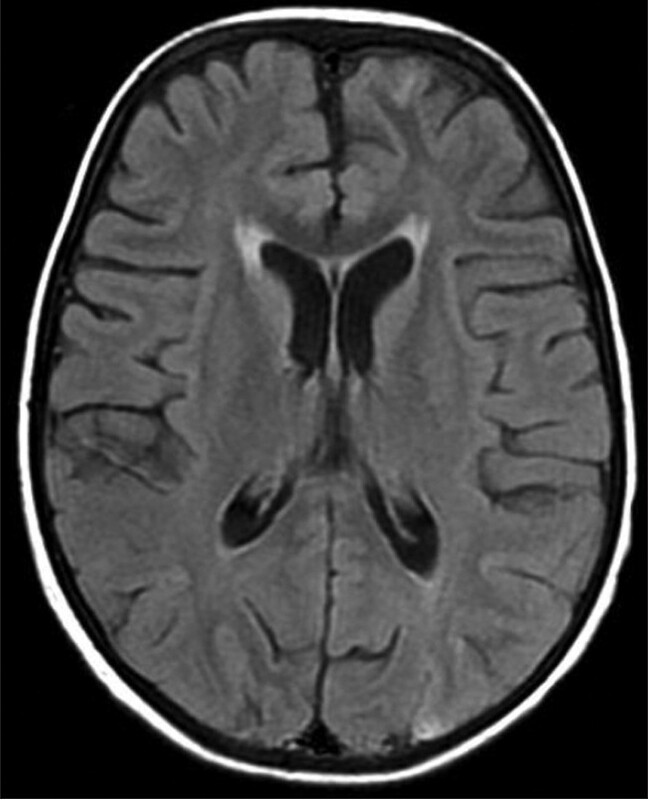 Mirza A. Posterior reversible encephalopathy syndrome: A variant of hypertensive encephalopathy. J Clin Neurosci 2006;13:590-5. 8. Casey SO, Truwtt CL. Pontine reversible edema: A newly recognized imaging variant of hypertensive encephalopathy? AJNR Am J Neuroradiol 2000;21:243-5. 9. Ahn KJ, You WJ, Jeong SL, Lee JW, Kim BS, Lee JH, et al. Atypical manifestations of reversible posterior leukoencephalopathy syndrome: Findings on diffusion imaging and ADC mapping. Neuroradiology 2004;46:978-83. 10. Onder AM, Lopez R, Teomete U, Francoeur D, Bhatia R, Knowbi O, et al. Posterior reversible encephalopathy syndrome in the pediatric renal population. Pediatr Nephrol 2007;22:1921-9. Kumar, S.S., Kumar, M., Shobhana, S., Sampath, S., Kulandai Kasthuri, R.